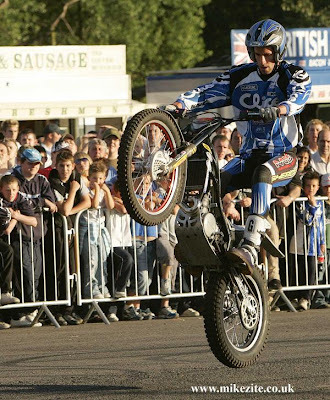 Gary Jenkins is the Welsh Trials Champion and in 2007 at the very first Big Stunt Wars competition Gary Impressed the judges (the Crowd) with his bike skill and ability to look good in lycra whilst balancing and riding his bike. With the Loudest cheer going to the Super Bike Guys. Gary is looking to take the title “King Of Stunts” from the Super Bike guys this year, and has a few surprises up his sleeve, stay tuned .